This exceptional South Wayne treasure was selected for 4 awards, including the 2005 Palladio Stable award in 2005, after being meticulously renovated and restored with designs by Arched Buchanan in 2002. 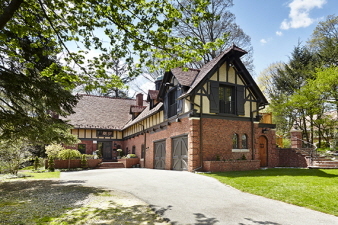 Recent expansions by renowned Ranieri Kerns and Associates (RKA) have further enhanced the already incredible living spaces while perfectly preserving the original charm and artistic exterior of the 1898 Carriage House, originally designed by renowned architect William L. Price for the Alan H. Reed Estate. Unique features include stunning antique random width oak floors, massive original exposed beams, exquisite arched horse stall windows, beautiful Gourmet Kitchen and Breakfast room, meticulously crafted millwork and architectural details, gracious room sizes and luxuriously renovated Master Suite and baths. Lovely bright French doors lead out to breathtakingly landscaped, private grounds with brick patio and within walking distance to Wayne, renowned schools and more. A true gem!